I have a fairly decent sized handful of Robinson's pubs in my CAMRA Branch area. In fact we will be meeting at one of them next Tuesday. I can't say Robinson's beer is my favourite by any means, but it is good to see they are investing for the future. A new six figure brewhouse will be built to run alongside its existing Stockport facilities which will still be used for the production of its range of specialist ales. Oliver Robinson said ""I'm the sixth generation of Robinsons to be at the helm, and I very much hope that my children will continue here. These investments send out a clear message that we are here to stay and that Robinsons intends to continue to be at the heart of Greater Manchester." Good for them. That's the thing about (most of ) the remaining Family Brewers. They are in it for the long haul. A phone call from the Landlady. She is in the Baum in Rochdale and tells me to get there quick. I can't, I have to go out soon. Why is my presence required? 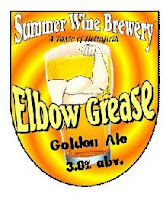 It seems there is a beer on called Elbow Grease from Summer Wine Brewery in Holmfirth. She says I'd love it. I don't know the beer or indeed the brewery, but it may still be on tomorrow. If it is as good as she says, maybe not. We'll see. Well, wasn't that fun? Seems like the term "cask ale" was a clear winner. With 53% of the vote, it could form its own government in this country. Perhaps the biggest surprise to me was the number that voted for "craft". Still, whatever was voted for, it was an interesting little exercise. Thanks to all 98 that voted. Just for future reference, here's how it went. We Forgot We Were Brewers! Speaking to Scotland on Sunday, Scottish and Newcastle's boss Jeremy Blood (who has been with them since 1988) said about the takeover by Heineken " S&N had become a deeply unpopular company among mainstream beer drinkers. In a sense Heineken has changed all that. There is some truth to say that British plcs chasing the next six months' results are forced into taking shorter-term decisions. We lost some of our reverence for beer, we cut corners. It (the takeover] has reinvigorated our passion for beer. We used to call them manufacturing sites. Now we call them breweries or cider mills. It's a small change, but it is significant." Don't worry though, Heineken have sorted it all out already. Interestingly, "premiumisation" is the answer. In other words we are drinking less, so charge more for it. Oh and serve it in smaller measures. Blood also wants to move away from beer being sold like beans in supermarkets by "decommoditising" it over the next ten years. He also thinks lager might be better served in different draught sizes and smaller, more elaborate glasses with a large head, as our tendency to drink pints does not allow for much difference in price between lower and higher end products. It would have been good if he'd mentioned such things as quality, individuality and taste, but I suppose that would be too much to ask. While it is nice that S&N are thinking like brewers again, it is a pity they didn't think more like brewers when they actually were . After my little rant of yesterday, something to calm me down and make me smile again. The Society of Independent Brewers (SIBA) has just announced that their beer volumes for 2008 were up 10% on the previous year. they expect a further 15% rise this year. This compares with a drop of 5.5% year-on-year fall in sales by British Beer and Pub Association members in 2008. SIBA put the growth down to rising distribution, with the average number of pub customers per brewer growing from 79 to 94 last year. Increased rate-of-sale also helped — throughput of local beers grew by an average of nine per cent over the last two years. Even better news is that three out of four SIBA members will increase brewing capacity this year. So there you have it. Give the people drinks they want to buy and they will buy them. Stop restricting the market and you'll get more local beers. Cask beer continues to be the only bright light in an otherwise dull pub trade story. It must have something going for it. The SIBA report that prompted this story is here. For someone like me who spent a large part of my formative years campaigning as a Trade Unionist against Tory malpractice in government, it should stick in my craw, but doesn't actually, that the Tories have come up with a semi decent plan to save the pub. Now pour me a WKD and tell me I'm not dreaming. Isn't this what the bloody Government should be saying instead of continually undermining our pubs? Who amongst my reader (bless him) thinks this is wrong? Instead this stupid government continues by default to support home drinking while pubs struggle. It encourages uncontrolled drinking by contributing to making controlled drinking more expensive than it otherwise would be. It has a minister responsible for pubs that freely confesses he never goes in one. An out of touch government or what? Time for a change? A change of policy certainly. A change of government? That's up to you. Rant over. The Morning Advertiser has a nice article on this subject here. It appears Marble Beers Ltd may be about to open their third outlet. In addition to the well known Marble Arch and the Chorlton based Marble Beer House, it seems they are currently negotiating the lease on 57 Thomas Street in the heart of Manchester's Northern Quarter. According to Taste of Manchester, the aim will be to open in a couple of months. Sounds good to me. While nothing is known of what sort of place it will, be it will no doubt be serving a wide range of traditional beer. The Thomas St area could do with such a place among all the trendy bars, though maybe it will be just as trendy, but serving better beer. I have been thinking about the term Real Ale, prompted this time by Boak and Bailey, but I have discussed it before. Is the term out-dated? I don't use it personally and there are alternatives. 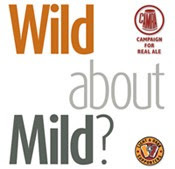 While I reckon CAMRA is unlikely to change its name, what do others think that the beer commonly known as real ale should be called? In the first ever poll on this blog, tell me what you reckon. Seems that our friends at Greene King have come to an agreement with JDW to replace the 99p Greene King IPA with GK brewed Ruddles Best. According to the Morning Advertiser, "Wetherspoon chief executive John Hutson said that Ruddles Best would replace IPA this week or early next. He added: “Rather than fall out with Greene King we’re happy to stock Ruddles Best. It’s slightly stronger at 3.7% abv and it’s every bit as good a pint." I guess we could argue all day about whether it is as good (or as bad) as GKIPA, but GK save face and still get the contract. Win win? Not so sure about that, but if you are inclined for some cheap GKIPA, get in quick! This has been mentioned on the odd blog or two recently. Hopefully it never comes to this! My local has been in the press today. No less than the Daily Telegraph. It is a nicely written piece by Arthur Taylor, who I have met (though quite some time ago) when he came to pick brains for a different article he was writing. He is a nice guy. He finishes by saying: "The customers are almost entirely local but welcoming, tolerant and utterly at ease with strangers. Quite right. Nirvana is here and it is theirs." Told you it is good. Problem is very few will be able to afford it, given that banks are wary of lending cash and while interest rates are low now, they may not remain so. Nonetheless it is an interesting development and a possible way out for some, from the albatross round their necks that is the average Pub Company. Tyson has already mentioned our somewhat odd outing to Ramsbottom to allegedly sample trial Thwaites beers. Instead we were treated to a kind of bizarre charade, with only one trial beer being available of the four offered, not that we knew this at the time. It is strange though how, when you are advised that you are drinking Thwaites beer, that your mind closes to the possibility of the beers sampled being something else. Both Tyson and I recognised that one beer was chock full of diacetyl and one other had an odd but familiar spiciness, without making the mental connection to say "Aha, These cunning sods from Thwaites have brought some ringers in, namely Deuchar's IPA and Greene King IPA." Now both of us I think can be excused the GKIPA blunder, as I doubt if any has passed our respective lips for a long time, but it just goes to show that you can fool some of the people some of the time, even a couple of hardened soaks like us. Now I have to admit that the GKIPA wasn't that bad. You wouldn't want a lot of it, but it was better than the Deuchars and the Thwaites trial beer, which we placed a comfortable last. That at least serves them right. What came top? As it turned out it was none other than Taylor's Landlord. Now I'm not sure what the other several hundred (as it seemed) people came up with, but hopefully Thwaites will get the message that producing another bland beer in the hope of stealing some of the bland market, just isn't going to cut it these days. An odd night out indeed and a slightly perplexing one. Last night was different. An old work colleague and I met for a limited time. We went to the Grey Horse in Portland St, Manchester, a tiny tied Hydes house. We drank the straightforward and easy going bitter. On this occasion catching up was all we wanted to do and the beer, for once, was incidental. A good perspective reminder. Of course recidivist that I am, I couldn't resist popping into the Marble Arch for a quick half on the way to the bus stop. 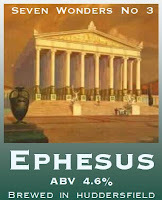 Mallinson's Ephesus gave me a last hop hit. I am never disappointed with their beers. Now this isn't my favourite bit of being an active CAMRA member, though it does give me as Branch Chairman, a much needed chance to talk to more licensees. I had five to survey this year and did two at lunchtime. Both were fully up to snuff I am happy to say and well deserved of their GBG nominations. I rarely have a drink on these visits, as I'm driving, but today, a pint of Lees Brewer's Dark was luscious with chocolate and roast malt notes, while Holt's Mild was full bodied, quite bitter for the style, with a dry finish. Two lovely and contrasting local milds. Grand. I suppose surveying does have its compensations. 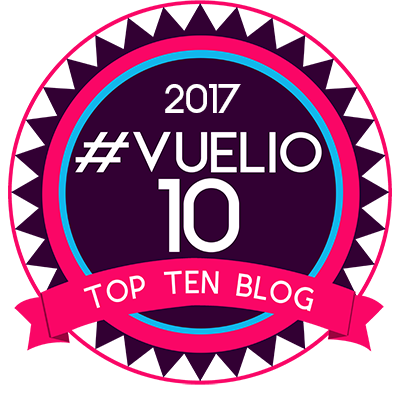 Do you want to know the top ten beers in England in 2009? It is only February I hear you say, how could there be such a list? OK, let's assume it is "so far", which isn't very, which makes this sort of nonsense even dafter. There is plenty wrong with this list, but one or two things stand out. At number four we have not even one beer, but several. At number ten we have a beer that isn't even available in England. At number nine, the vintage isn't mentioned and they don't all taste the same, so same issue as number four. Is there an ordinary drinking beer as opposed to strong bottled beers there? No! Is this list compiled mainly by a load of Americans from the list of imported bottles they can get? Yes. Is this by the Ratebeer organisation that people rate (no pun intended) so highly? Yes. Another good reason to take what they say with more than a pinch of salt. "With the cost of a pint ever increasing, the savings of buying in bottles and drinking at home with your local and non local friends online can be very substantial. A $4 pint with a $1 tip five times a week versus a top shelf six pack is $100/month versus $40/month, a $60 difference. That's a big win. And besides saving money and improving beverage quality, spouses will be thankful that RateBeer can be enjoyed from the home, without a block of driving. " Your local pub and bar will be pleased about that no doubt, but maybe the kind of people who sit rating beer online with their virtual chums are best kept out of pubs anyway!. It was a wintry walk to the pub yesterday. Muck spreading was in full swing and the scent of it accompanied us for most of the one mile uphill walk. 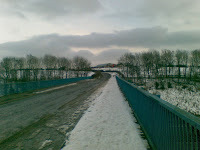 The lane was covered in an unappealing mixture of slush, mud, cow muck and silage. We picked our way through it, fearing that the many dogs that come to our little boozer would be very smelly indeed. The pub was busy and the beer and company good. There were many dogs and indeed some were smelly, a fact that their owners are either oblivious to, or choose to ignore. A stranger's Jack Russell snapped at the pub cat. Bad form. A murmur of discontent rippled through the room, but Snug, the cat was fine. She retreated to a barstool and went disdainfully to sleep. We couldn't get our usual table causing much mirth with the staff and regulars. We are so much of a fixture in that position that we look out of place elsewhere. Eventually, nearly two hours late, we managed to grab it and all was well. The Lees Bitter was in fine form. We left in a snowstorm to catch the 18.10 bus, which didn't show. Thanks again for nothing First Bus - the only real blot on a good day. 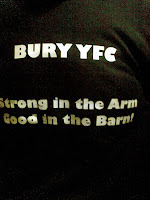 The second picture shows the back of the fleece the daughter of one of the farmers was wearing. It amused me anyway. When I visited Düsseldorf and Cologne, places I know very well in drinking terms, I was struck by how amazingly busy the pubs all were. Although my observations are from these two big cities, I have witnessed similar scenes throughout Germany. Germany was just entering recession and yet the pubs were going like a fair. I have been formulating some ideas to explain why they should be doing so well, in the kind of vague hope that suffering British pubs might adopt some of their ideas and start to thrive again. I have concluded though that while I reckon I know some of what makes German pubs tick, it isn't going to be repeated here. Firstly it has to be said the pubs I am talking about here, mostly are the independently owned Alt and Koelsch houses and these are different in some ways to mainstream pubs, (though most pubs in Germany are independently owned) but perhaps serve to emphasise my point further. On a midweek night it was difficult to find a seat in any of them and when you factor in that really there is only one drink on sale in each - OK you can maybe get a wheat beer and various schnapps, but that's it- the popularity would have any pub operator here scratching their head in amazement. So why are they so busy? food is genuinely home cooked, not bought in frozen and is reasonably priced and plentiful in portion. No "chicken ding" here! Perhaps it is simpler than that. The over riding factor is that German pubs still deliver a product that people want. They don't need quizzes, karaoke, live "entertainment" or two for one inducements to enjoy a night out in the pub. Drinking at home in Germany is inordinately cheap - even for quality products - but it doesn't prevent people going to the much more expensive pub. Due to somewhat enlightened alcohol taxation, German pubs have always had to counteract cheap beer at home and have done so by giving customers a comfortable, value for money, traditional environment that encourages customers to want to come back. It puts the pub and pub going firmly in the mainstream of German social life. They can and do visit to socialise, eat and drink and just to enjoy an atmosphere that is usually buzzing with friendly conversation and laughter. The Germans even have a word for it - Gemütlichkeit - which can best be described as "socially cosy." Doesn't that sound the sort of place you'd like to drink? So, are the Germans just like us? Yes and no. That is why I conclude that what works in Germany does not necessarily work here, though adopting most of my bullet points would improve most of our pubs 100%. (Of course it has to be said that adopting these points would also be good for some German pubs no doubt) There are of course bad'uns in Germany too, but in mainstream pubs standards are much higher. Germans expect and demand high standards. It is different here in the UK and attitudinal, market, social and ownership issues muddy the water. But perhaps pubs here are failing to meet even our low expectations? I'll try and give a view on that next. There is rather a good page on Wikipedia about Gemütlichkeit. It is not just environmentally warm, but promotes the notion of belonging, social acceptance, cheerfulness, the absence of anything hectic and the opportunity to spend quality time. I've just watched an old episode of Minder, probably from the early eighties. An old lag (played by Pete - then Peter - Postlethwaite) returns to London after a few years at Her Majesty's Pleasure and some more on the run in Spain. He remarks sadly to Terry and Arthur that "Everything's changed. You can't even get a decent pint of keg any more. It's all that real ale stuff." It's just the same now Pete. You still can't get a decent pint of keg! The Good Beer Guide Selection Meeting went well. It had a very good number of attendees, debate was sensible and considered and we came up with an excellent set of pubs to survey. The Baum, our hosts also excelled. 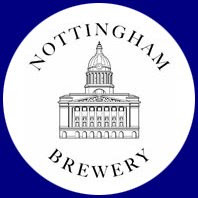 I started off with Nottingham Pale Ale, a pale, hoppy little 3.8% number. I knew this wouldn't last. Despite other excellent beers including a new "Ticker's Beer" from Phoenix, word of its quality spread and all too soon we had drunk them dry of it. Replacements included a superbly hoppy and bitter Marble Pint - served in much better condition than the Marble Arch sometimes manages and a wonderful example of Phoenix West Coast IPA which was resinously hoppy and moreish, despite its 4.6%. The Regal Moon offered us Elland Savannah among a pretty good selection, while a boisterous (United were live on Sky) Flying Horse gave us a slightly off the mark Phoenix Arizona (unusual) and some very acceptable Moorhouses Blonde Witch. I've said it before, but Rochdale rocks at the moment beer wise. All we needed was some Pictish, though I did have a pint of Pictish Liberty in the Marble Arch on Friday, which was frankly, disappointing, lacking the smack of Liberty hops I'd expected. Still you can't win 'em all can you? Yes all the beers I drank were pale and hoppy!